These days with cheap recording and CDs that can hold 80 minutes of music some releases just go on and on. But, just because you can, doesn't mean you should. That's why I like the EP as way for artists to present their music. Short and sharp, all killer, no filler. But with enough space to present some different ideas and styles. Some of my favourite NZ releases ever have been EPs - The Gordons Futureshock EP, The Tall Dwarfs Slugbuckethairybreathmonster, The 3Ds Swarthy Songs for Swabs. So I'm pleased that bands and musicians are still putting out EPs. There may even be a bit of a resurgance. This episode features new releases that are all EPs. Just a few months ago I was wondering whatever happened to Gin Wigmore, who in 2004, as a teenager, won the prestigious International Songwriting Competition. She disappeared from view but mere minutes after I said that she was sadly lost she re-emerged with her first release, an EP on a major label called Extended Play. NZ has no shortage of female singer-songwriters at the moment, but what sets Wigmore apart is her extraordinary voice, the kind that polarises opinion. I'm firmly in the "love it" camp and I'm impressed by this EP, where the songs place that voice alongside strings and piano but in a way that doesn't sound too lush or overpowering. The EP includes a newly recorded version of the song that won the International Songwriting Competition, 'Hallelujah'. Cassette are renowned for taking a long time between releases. There was something like a six year gap between their debut, the Emo EP, and album Cut For Summer. 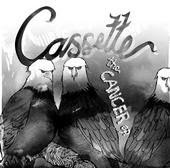 Now, a year or two later with what seems like unseemly haste for Cassette they have a new EP, Cancer. Well, not really new. The songs were actually recorded before the album but have been unreleased up till now. The EP is no collection of left-overs though. Cancer includes plenty of the kind of languid, laid-back, country rock that the band are so good at. Also recently releasing EPs are lo-fi artist Bannerman who has recored an EP of pop songs featuring horns and strings, but using only one microphone, and young Christchurch dance-punks Bang Bang Eche who have a self titled EP out now. Both are great, although the Bang Bang Eche EP is really hard to track down. Why is it that so often I go to the record shop to buy a new kiwi release and its not stocked, even by the stores with huge and varied stock like Real grovvy or JB Hi Fi. (By the way I have no idea whether the band's name should be pronounced Bang Bang Ekk, Eek or Etch.) You can hear a live Bang Bang Eche song here and there are videos for both them and Bannerman on the video page. Rugby may be New Zealand's national game and the All Blacks revered with fervour by many kiwis but when it comes to inspiring songwriters the Men in Black seem to stimulate more hackneyed cliches than lyrical grace. In recent years Steve Edwards and Tommie Brewster have both made musical attempts to place the All Blacks on a pedestal. In both cases banality and stereotypes are to the fore - 'the land of the long white cloud' comes up in both, there are plenty of exultations of belief that "you can bring it home" (the World Cup that is), and in Steve Edwards' Men in Black, even Ed Hillary and the spirt of the Anzacs are invoked. Meanwhile, with it's "humouress" French / Kiwi lyrics and cheesy synths, Tommie Brewster's 'Sweetaz Mon Ami', which was released on the eve of last year's ill-fated All Black World Cup attempt, is a serious contender for worst song of all time. UPDATE: Tommie contacted me and took my criticism in very good humour. Tommie Brewster had a hit with Sweetaz Mon Ami - over 5000 copies sold! So what would I know. Some of the better songs about rugby and the All Blacks come about when the songwriter is taking a critical rather than hagiographic stance. In 1960 Howard Morrison recorded 'My Old Man's An All Black', a local take on Lonnie Donegan's 'My Old Man's A Dustman'. 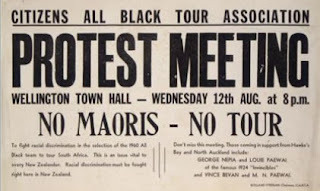 While the Morrison version retains the comedy of the original the new lyrics also critique the decision to take an All Black team with no Maori on tour to South Africa at the request of the South African Rugby Union. This is probably New Zealand's first protest record. One rugby song of recent years that is worth a listen is the Matakanui Mens Choir's 'God Defend The All Blacks' (There is great clip for the song on the video page). A simple but stirring listing of legendary All Blacks to the tune of God Defend New Zealand the song achieves what 'Sweetaz Mon Ami' so miserably fails, to balance a love of the game and the team with a tongue in cheek poke at the reverence with which the All Blacks are regarded. It was a game of two halves, but rugby was the winner at the end of the day. Sometimes it can be interesting to take a look how a musician's work has evolved over time. Coming from a wine growing area, Waiheke, I've borrowed a viticultural term for this - a vertical tasting. 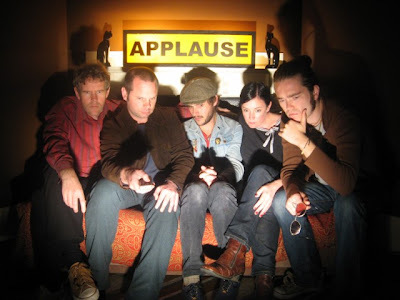 John Guy Howell (second left) is the main songwriter for self described "folk pop" outfit, The Broken Heartbreakers. I guess most other people would call them country. The band revolves around the duo of Howell and partner Rachel Bailey who sometimes play as a duo but prefer hitting the stage with their five piece band line-up. They've just released their second album which they pretty much regard as a debut, downplaying (and under-rating) the first as more like a glorified demo. At around the same time John was in another short lived band named Too Many Daves. I haven't managed to track down any recorded material by them but a video clip of a live performance by the Daves at the best pub in the world ever, The Empire Tavern, is on the video page. In 1995 Howell formed Alpha Plan, along with Victor Billot and Mark Orbell. The music was a bit darker and more political than Tin Soldiers, particularly on their first album, City of Bastards, recorded in 1997. I prefer this to their second, Stratford Workshop, which was recorded in the UK and released in 2001. Since then John has taken a step away from angry boy guitar music. In fact at one point a few years back he told me he couldn't even stand listening to that type of stuff anymore. His first recorded venture in a quieter more laid back direction came when he produced, co-wrote and performed on the first album by spaghetti western instrumental Auckland band, Salon Kingsadore (named after an Invercargill hair salon that had a notoriously bad television ad that screened in the bottom of the South Island). Then in 2002 The Broken Heartbreakers were formed. Howell's songwriting made a great match with Rachel Bailey's voice and the band have gone from strength to strength. They have a strong live following (for a taste take a listen to a live performance recorded for national Radio - stream) and with their second album have really come into their own. The band say they wanted to produce an album that could sit on the shelf alongside their musical heroes and they've achieved that. This is definitely a contender for my best of the year list. You should also take a look at their stunning website, listen to an interview with John on Plains FM, a community radio station in Christchurch, check out a live performance (stream) recorded for National Radio, or take a look at the live clip on the video page. What's on the Governor General's iPod? The release of the Queens Birthday and New Years Honours lists may be not be an event that many kiwi music fans hang out for, but actually, over the years many musicians have been recognised. 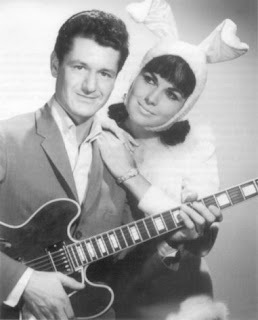 In this years Queens Birthday list 1960's kiwi guitar legend Peter Posa got the nod, being made a member of the NZ Order of Merit (MNZM) for services to music. Posa joins a long list of musicians who have been honoured in recent years including Mahinarangi Tocker (MNZM), Eddie Low (MNZM), Tina Cross (Officer of the NZ Order of Merit) check out her website, it's kind of scary, Whirimako Black (ONZM), Midge Marsden (MNZM) and Bic Runga (MNZM). Go back a few years earlier and the list includes Moana Maniapoto (MNZM 2004), the Dobber (ONZM 2003), Mike Chunn (ONZM 2002), Wayne Mason (MNZM 2002) and David Kilgour (MNZM 2001). An ONZM is equivalent to an OBE in old money, while an MNZM replaced an MBE in changes made to the honours system in the mid 1990s. Ray Columbus picked up an OBE in 1974 and Howard Morrison became Sir when he was knighted in 1990. (The granting of the titles Sir and Dame was dropped in 2000). You can see Ray Columbus and The Invaders on the video page. This episode of Counting The Beat features some of the music of those who have received royal or state recognition for their musical contribution to the country. Think of it as taking a listen to the Governor General's iPod. Although, I'm not sure what he'd make of the Howard Morrison track. Note: Quite a few of the links in this post take you to a site named New Zealand Music of the 60s, 70s and a Bit of the 80s. It's probably the most comprehensive and valuable reference sites around on NZ music of that era and is well worth a look.